This year SAM recognized a member who has carried the torch longer than most have snowmobiled. He has been negotiating snowmobile access with private landowners and the DCR for an eternity. Well maybe not eternity, but I’m sure it seems that way to some of the DCR personnel that had to negotiate with him. His passion was unmistakable. He started riding around 1969 and has been a leader in his club and the association ever since. He was the first-ever SAM delegate for the Adams Sno-Drifters. He has organized countless rides and events over the years but the one thing that most of are thankful for, is his oversight and work to maintain access for snowmobilers at the highest peak in the state. 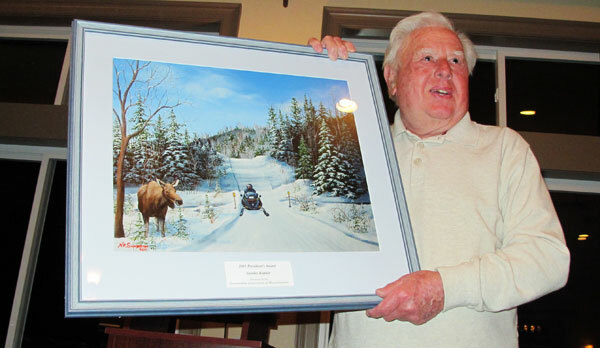 The Snowmobile Association to proud to honoring the Godfather of Greylock, Stan Kopala.